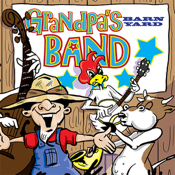 This songbook for children and classrooms is based on "Grandpa's Barnyard Band", taken from CJ's "FARMdamentals" recording. This animated "Sing 'n Read" songbook engages every child with hip music, clever and familiar lyrics and pitch-perfect illustrations. Each word is highlighted in real time as CJ sings it, which helps children learn to read and recognize vocabulary. You've never seen or heard traditional kids songs like this before! "Grandpa's Barnyard Band" is Song 5, in a series of 12 from the "FARMdamentals" Sing 'n Read Storybooks.